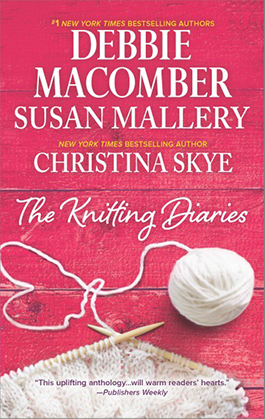 Three cozy romances from Debbie Macomber, Susan Mallery, and Christina Skye. "Susan Mallery pens a romantic tale of rediscovering life in Coming Unraveled... These three charming stories of young ladies trying to put their lives back together are very uplifting and inspiring. You are sure to enjoy each of these romantic tales." "Coming Unraveled is pure romance and an utterly captivating love story." Robyn stepped through the doorway and let her small duffle drop to the floor as her gaze move back to the table. A cowboy? Here? Only Ewe was a popular Georgetown, Texas knitting store, and while there were a few male customers, women outnumbered them at least a hundred to one. Robyn couldn't remember ever seeing a guy sitting down with a project, talking away as if he belonged. She remembered something about her grandmother mentioning a man had joined their regular group, but Robyn had be picturing someone older and not quite so hunky. Not her problem, she told herself. Customers, whatever shape, size or gender, were always welcome. That had been her grandmother's philosophy. It made sense. Without customers, the rent didn't get paid. Robyn glanced around at the bustling space, noting that Adeline, one of her grandmother's two best friends, stood at the cash register, while Marion, the other best friend, helped a young woman who was very pregnant. Eleanor, her grandmother, was probably in back, looking through the new yarns to find something special for a favorite customer. There was a warmth to the store, she thought happily. A sense of belonging. What on earth had she been thinking, staying away so long? Quick, annual vacations had only made her miss home more. Adeline completed the purchase and looked up. She spotted Robyn, clapped her hands together and shrieked. "Eleanor, hurry. She's back. Our girl is back." Everyone turned to look at Robyn, but she only saw the three seventy-something women rushing toward her. She tossed her duffle, held out her arms and breathed in a sigh of relief as the women who had always loved her hugged her until it seemed like her ribs were going to snap. Nothing had ever felt better. She felt warmth and inhaled their various perfumes. Adeline, tall and intimidating with a stern appearance, wore the scent of roses. Marion, still coloring her hair a golden blond, was shorter, rounder and favored White Diamonds. Then there was Eleanor, soft and pretty, wearing Chanel Number Five. The mingling scents had been a part of her childhood for as long as she could remember. Anything she'd made in the store had been infused with the delightful blend, comforting her during stormy nights or when she was sick. "Let me look," Eleanor said, shooing the other two back, then putting her hands on Robyn's shoulders. "I've missed you so much." Robyn felt her own eyes burn with tears. "It's been too long." "Six years," Adeline said, as if any of them would forget. "Visits don't count, young lady. We were wondering if that city was ever going to let you go." "New York is like that," Marion said, her hands fluttering. "A difficult place. Oh, but our girl is so glamorous now. And thin." Marion patted her own ample hip. "Thinner than you were when you visited last year. You look like a model." "High fashion," Adeline sniffed. "You look like you need a sandwich." "Leave her be," Eleanor told her friends. "She's just barely in the door. Let her get her feet under her." Eleanor smiled at Robyn. "I'm so glad you're home." Robyn hugged her and then just held on. "Me, too. I should have come back a long time ago." "To be with a bunch of old women? Why would you want that?" Six years ago Robyn would have agreed with her. Leaving Georgetown, going to New York, following her dream, had meant everything. But dreams were tricky things and hers had pretty much chewed her up and spit her out. Right now something close to normal was looking really good to her. "I need to clear up a few things here," her grandmother told her, stepping back and smiling. "Do you want to go on ahead to the house or wait for me?" "I'll wait," Robyn said, bending down and picking up her duffle. Marion's gaze followed her action, then she grinned. "Presents?" It was a familiar tradition. Whoever went away had to bring back something for those left behind. She set the duffle on the counter by the cash register, then opened it. For Adeline, she had bought an oil painting of New York in the rain. Robyn had loved the artist's work since she'd first seen it two years before. The tall, gray-haired woman stared at the small framed painting for several seconds. "It's very nice," she said gruffly. "I know just where I'm going to put it. Thank you." Next came the lace she'd found in a vintage shop down in the East Village. "They said the bolt dates back to the 1950s and it's just like the one Grace Kelly picked for her veil," she said, handing the folded fabric to Marion. "Every bride should be a princess on her wedding day." Marion sniffed, then lunged for her. "Oh, Robyn. It's wonderful. Thank you." Robyn turned to her grandmother last. "For your collection," she said, pulling out a tissue wrapped Steiff bear. "He's a handsome devil, circa 1920, in perfect condition." Eleanor sighed as she carefully took the present and unwrapped it to see the gift that had cost Robyn her sofa, TV and her last hundred dollars. The price of Adeline's gift had been her bed and night stand, and the contents of her fridge, while Marion's lace had been the easiest to acquire. She'd only had give away a Michael Kors cocktail dress she'd bought off the back of a truck and make sure the previous owner of the lace got Robyn's lunchtime shift at the Wall Street bistro where Robyn had worked. "He's wonderful," Eleanor breathed. "But you're far too generous." "You're my family. Who else would I be generous with?" The gifts were easy, Robyn thought to herself, it was telling the truth that was going to be hard. And not something she was dealing with today, she reminded herself. She zipped the duffle, then flattened it. As she went to tuck it under the counter, she happened to glance toward the table in the back, where the knitters sat. Most of them were busy with their own work, barely paying attention to anyone else in the store. But the man she'd noticed—the tall guy in the western style shirt—was focused entirely on her. His dark eyes seem to burn their way into her skin, and not in a nice way. He looked angry and determined. He looked like he hated her. His steady gaze made her heart stutter a little. From concern, she told herself. There was no way she found that horrible man appealing. She stiffened, her chest tight and uncomfortable. "Who's the guy?" she asked, knowing she hadn't seen him before on her infrequent visits home. Eleanor looked over her shoulder and smiled. "That's T.J.. He came to us what, two years ago?" "Nearly three," Adeline corrected. "He was in a car accident. Serious injuries. He could barely move his hands." "His doctor thought knitting would help," Marion added. "He came because he had to. For the first six months he didn't speak a word. Just sat there, trying to knit a row." "We saved him," Eleanor said, sounding proud. "I think I've told you about him a few times. He's all better now." "He's not a puppy," Adeline told her. "We helped him. He saved himself. There's a difference." Robyn glanced over her shoulder, prepared to say that for some reason the man seemed to hate her. But as she looked again, she saw he wasn't paying attention to her at all. When he did look up, his eyes carried the mild curiosity of any stranger. She faced front again, wondering if the long drive had tired her more than she'd thought. She must have imagined his animosity. After all, how could someone who never even met her loathe her on sight? Robyn parked in front of her grandmother's pretty house in a quiet, suburban part of Georgetown. The houses all looked pristine—paint and landscaping all kept fresh and neat. This was a part of town where people took pride in their homes. She got out of the clunker she'd borrowed for the trip home. It was a car shared by a group of people. Robyn wasn't sure who even owned it. She just knew that in two days a guy would arrive to drive it to California. Her job was to make sure it was full of gas and to hand over the keys. Her grandmother limped toward her. "What can I carry in?" "I'll get it," Robyn told her, frowning slightly. "Should you ice your knee?" "At this point, it's beyond help." Eleanor grinned. "But in a few weeks, I'll have the left knee of a thirty year old. I've asked the doctor if he can do that to my behind as well, but he ignores me." Robyn laughed. "Grandma, are you flirting with your medical professional?" "Mostly giving him a hard time. Now hand me something to carry." Robyn passed over the lightest of the bags, then grabbed two more for herself. Deconstructing her life had taken less time than she would have thought, but despite selling or bartering nearly everything she owned, she'd still filled the car with her stuff. Once they were inside, Robyn followed Eleanor to the room that had been Robyn's since the death of her mother. The windows were clean, the curtains freshly washed. The faint smell of new paint made her frown. "Tell me you didn't paint this room for me," she said. "You're supposed to be taking it easy until you have your knee replacement surgery." "I didn't paint the room." Her grandmother winked. "T.J. did it. He's the nicest man. When I mentioned you were coming back and that I wanted to spruce up your room, he volunteered." T.J. of the glaring eyes? Robyn had trouble believing that. After leaving the luggage, they went into the kitchen where all important meals, discussions, and decisions occurred. Eleanor got out the kettle to make tea. Robyn took it from her. "Go sit. I'll deal with this." "You're tired from your long drive," her grandmother protested. "I can still boil water." Everything was where she remembered. The delicate porcelain cups and saucers decorated with flowers. The carved wooden box that contained a dozen or so different types of loose tea in worn tins. The tea balls in the drawer to the right and the teapots themselves, in the cupboard next to the stove. "It's wonderful to have you here," her grandmother told her from her place at the Formica kitchen table. "I've missed you." "I've missed you, too," Robyn told her. "I'm glad you asked me to come back." "I hated to take you away from your career. However long you can give me is plenty." There was no career, Robyn thought, feeling both ashamed and guilty. Once there'd been a dream, but it had died a couple of years ago, starved to death slowly and painfully. She'd actually been relieved when her grandmother had called and asked if Robyn could spare the time to take care of her after her knee replacement surgery. "I'm staying indefinitely," Robyn told her. There was no way she was heading back to New York, but that wasn't a conversation to have her first fifteen minutes back. She would bring it up gradually over the next few days. While she didn't have the details of her plan worked out, she had a basic premise. She would help Eleanor for as long as she was needed, then she would find a job locally. She was an excellent waitress, with plenty of experience and recommendations. With all the wonderful restaurants in the area, she was confident she could find something nearby. She planned to live cheaply, save money and figure out what she wanted to do with the rest of her life. When the tea was ready, she carried the pot to the table and poured them each a cup. Her grandmother stirred in cream, then took a sip. "Lovely," she breathed. "It tastes better with you here." "You got here quicker than I expected." Her grandmother set down her cup and stared at her. "Robyn, no. Why would you do that?" "I wanted to get home." Which was mostly true. There was also the issue of not wanting to spend the money on a hotel room. "I drank plenty of coffee." "My behind is a little draggy." Eleanor squeezed her hand. "Sometimes I worry about you. All right. I'm going back to the store. You stay here and rest. Climb into bed and don't think about getting out until I get home." Bed did sound nice, Robyn thought. Her body ached from the drive and her eyes felt gritty. "I'll get it," she said, pushing herself to her feet. She crossed the living room and pulled open the door, only to find T.J. standing on the wide front porch. He didn't look any happier to see her than he had before. Now that he was standing, Robyn realized he was taller than she'd thought, nearly a full head above her own five foot six. Lean, but with plenty of muscle, he looked like the kind of man who could handle himself in any situation. He had black hair that needed cutting and a determined expression. His dark eyes were cold and assessing, as they stared her over the threshold. If he would smile, she had a feeling he would be devastating...in a good way. "Marion says Eleanor is needed back at the store," he said. "I came by to see if I could help you unload the car." The kind words were totally at odds with his expression. It was like looking at a growling dog with a wagging tail. Robyn didn't know which end to believe. "T.J.," Eleanor said, coming up behind Robyn. "You didn't have to come all this way." "Still. You're so thoughtful." Eleanor patted Robyn's arm. "After T.J. helps you, dear, get some rest." "I will," Robyn promised, then had to resist the need to beg her grandmother not to leave her alone with a man who seemed to find her so wanting. But she'd been fighting her own battles for a long time now, so she ignored T.J.'s steady gaze and ushered her grandmother to her car. When Eleanor had driven away, Robyn folded her arms over her chest and stared at T.J.
"Why don't you tell me why you're really here," she said. "All right." He glared at her. "I know your kind and I know what you want. Don't for a minute think you're going to get away with it. If you're going to get to them, you're going to have to go through me."